Another great light meal for tea, this "easy peasy pizza" comes from the "I Can Cook" recipe book and requires you to make your own base, but you could also use a pre-made one. I wasn't sure about the grapes on to at first, but the kids loved it and it did actually taste really delicious. Rub together the flour and butter until the mixture resembles breadcrumbs, Slowly add the milk and stir with a fork until you achieve the desired consistency. Flatten the dough into a pizza base and place on a baking tray. 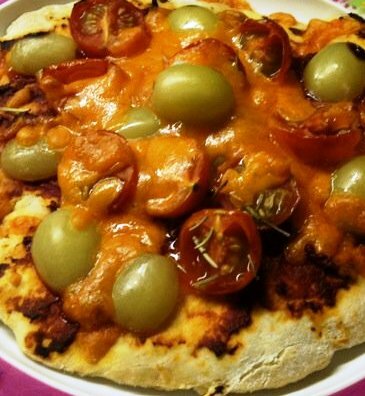 Arrange the grapes, tomatoes and rosemary over the top of the pizza base and sprinkle cheddar cheese over the top.